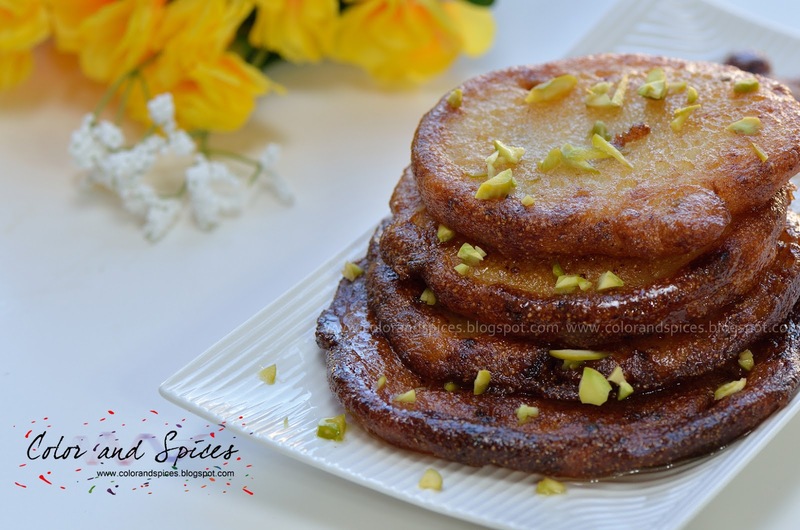 Malpua or Malpoya is Indian sweet pancake soaked in sugar syrup. It is very popular in Bengal, specially made during the occasion of Poush-Sankranti. There are widely varied recipes available for Malpuas. People make them differently based on their taste and choice. The basic ingredients for Malpua are Suji(semolina), flour, milk and sugar. Some add yogurt to it, some add home made cottage cheese(Chana), or some add fruits like coconut and banana. I follow the recipe I inherited from my grand-mother and my mom. My grand mother makes the best malpua I ever had. Whenever I make malpuas I always try to recreate that taste, but it can never be the same without my Dida's(grand mother) special touch. Here is the malpua recipe for you all, make a bowl full and enjoy the festive season with friends and family. 1. Measure the milk and warm it. No need to boil the milk, just warm it. Add semolina/suji to the milk and mix well. Let it stand for 15-20 min. Again mix well. 2. Add flour, sugar and mawa, mix well. Grate the mawa before adding to the mixture. If you do not get mawa, replace it with milk powder(1/2 cup) and ghee(1/2 tbsp). Add crushed fennel seeds and cardamom seeds. Cover the mixture and let it stand for at least 1 hr. 3. In the meantime make the syrup. Add measured amount of sugar and water in a pan and let it boil. As the sugar dissolves completely, lower the heat to medium. Add cardamoms to flavor the syrup. Keep the syrup hot. 4. The batter will be thick, almost like cake batter. Heat sufficient oil in a pan for deep frying. As the oil is heating up, bit the batter well. Add baking powder to the batter just before frying. 5. When the oil is hot, reduce the heat to low. Take a ladle full of batter and deep fry till nicely brown. Keep the heat to medium-low. Take out on a paper lined plate. Dip it in the hot syrup. 6. While serving, take the malpuas from the syrup to the serving plate and garnish with chopped dry fruits of your choice. Enjoy with friends and family...Happy Durga Puja and Navratri. 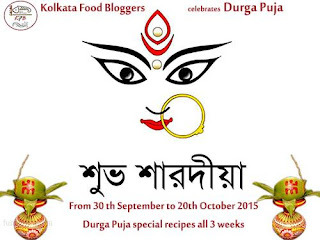 This post is going to the Durga Puja Special event of Kolakata Food Bloggers. Krishna make the batter thick, if it's thin then as you put them in oil to fry, it will start spreading and you wont get a perfect shape. Mouthwatering I must say. It was a staple Sat breakfast during my childhood. Tried the recipe today and it turned out awesome except for the shape! The batter was a little thin. How can I improve that? Hello Anwesha, measure the ingredients exactly according to the recipe given, use measuring cups used for baking purposes. And soak the semolina (suji) in the warm milk for at least 1 hr. If you find the batter is still thin then add little more flour and mix well till no lumps. Hope this will help you. So I'll soak the suji in milk for an hour and then mix flour, mawa etc and again keep for an hour? First soak the suji in milk for 20 min then add the other ingredients and let soak for an hour.